Tom Francis’ Gunpoint is utterly brilliant; the smartest game about hacking and rewiring – sorry Watch Dogs – that ever was. So there are plenty of reasons for his new project, Heat Signature, to worm its way into the part of your mind that you’ve saved for intriguing upcoming games. 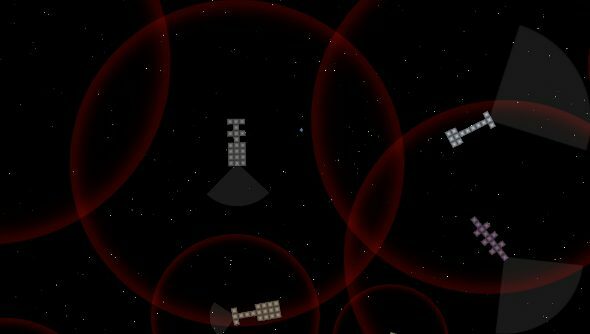 Francis has put together a video showing off the stuff you can get up to in this space game, which mostly involves breaking into other people’s procedurally generated spaceships and being a bit naughty. At this stage, it looks a bit basic at the surface level, but the 11 minute video reveals that it’s rife with elegant systems. One of the random missions in particular made this look very promising. As a thief – the other class at the moment is the assassin, and these roles determine mission types – Francis is tasked with breaking into a ship and nicking something. It’s a big ship. And when he docks with it, it’s clear that it’s not just big, it’s labyrinthine and crawling with guards. His prize is right at the back of the ship. While it would have been possible to cling to the walls, learn guard patterns and try to avoid getting shot and then flung into space – which isn’t a death sentence, as the player ship can be remote controlled and thus pick up its floating man-cargo – Francis buggers off instead. He looks around for another ship: one with guns. He finds one, takes it over, and then blows the end off the other vessel. Then he quickly gets out and back onto his own ship, as the ship he’s just shot at is in hot pursuit. Thankfully, it’s not pursuing him, just the vessel he hijacked. So he’s free to fly back to the rapidly spinning chunk of spaceship he just blew off, enter it and nick the item. This is all immediately reminiscent of Gunpoint. Not the setting, of course, but the design philosophy. Simple tasks made tricky with obstacles, and heaps of potential for experimentation.